Hesburger's Chicken salad is always a sure bet. 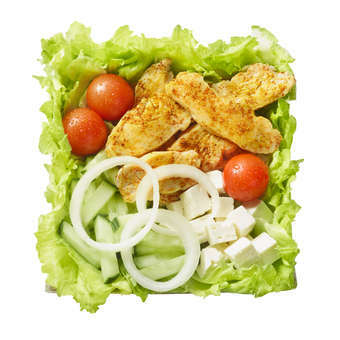 This delicious salad ensemble includes chicken fillet, Greek-style cheese cubes, fresh onion, cherry tomatoes and cucumber on a fresh iceberg salad. The salad comes with your choice of salad dressing and seed mix or croutons. As good as it gets!